Space cat evolution: Kitty collecting in galaxy - control the evolution of space cats on another planet. Match identical cats to get new forms of life. 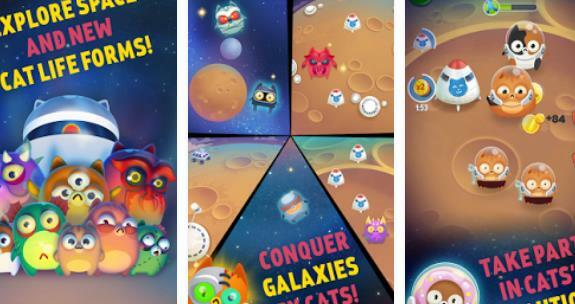 Help funny cats conquer the galaxy in this merry Android game. Cats settled across the universe. Now they can be of any unbelievable form. Tap the screen to get coins. Spend coins to unlock new kinds of cats. Match pairs of identical cats and unblock new cats having unique properties and appearance. Gather a collection of all galaxy cats! Download now the MOD APK of Space cat evolution: Kitty collecting in galaxy for free, only at sbenny.com!